This is 5-6 hour course is a introduction to the sport by learning how the glider works and learning to control the glider on the ground. Depending on your progress we will include a small flight from our 40 meter practice hill to get you off the ground and give you an idea of how it feels being in the air. This course will allow you to get a better understanding of the details involved and with this understanding, clarify whether the desire is there to commit to getting your full Novice rating which will give you the the skills and confidence to fly without supervision. Half the cost of the introduction course is deducted from your full Novice course should you decide to continue – let’s go fly!. Optional, bring your own helmet… like a ski helmet. A willingness to experience the best that life has to offer! 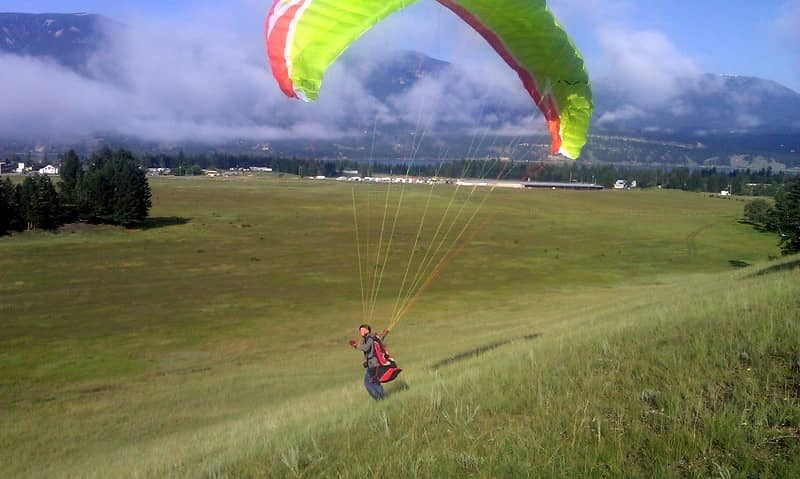 Tandem paragliding flights will be available at a discount for anyone taking the introduction to Paragliding course. Weather permitting, tandem flights may be booked immediately following the intro course on the the same day or evening.